Are you one of those people who always wish they can nibble on something yummy? Whether you're typing away at work or running errands around time, little refreshing morsels for food are always welcome. If you're always looking for a delicious treat to satisfy your insatiable sweet tooth, then you may want to start thinking about investing in a fanny pack. Fanny packs are great for toting treats around. Seriously, they're a lifesaver and this candy heart print fanny pack is particularly pleasing. It will hold all your small treats for snacking and your must-have essentials too; stuff it with candy, your keys, cellphone and wallet and you're ready to head out the door. The fanny pack is created by Fydelity, one of the leading brands in quirky-printed and fashionable fanny packs and backpacks. The adjustable strap makes this product a one-size fits all while the solitary zipper in the front holds all your valuables. A sublimated print of pastel candy hearts with loving messages is featured throughout the bag and will surely get you noticed. 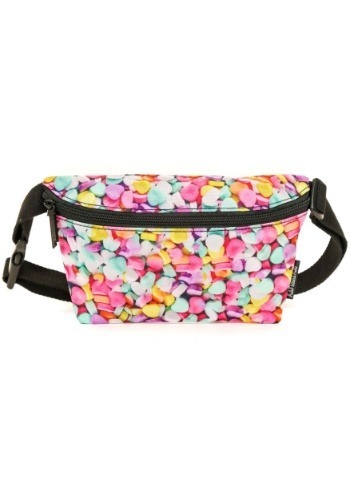 If you love this fanny pack, check out all of the Fydelity fanny packs we sell!